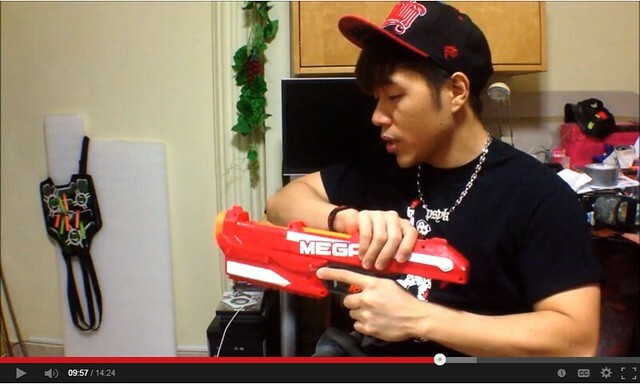 Yesterday, Singapore Modder PSYK released an unboxing video of the upcoming Mega Series Magnus. We learned some new things like how to load the blaster, and got confirmation on its internal magazine/clip. But digging around a bit more on the comments of the video and internet let me learn even more new things in addition to what the video provided. So here’s 8 New Things We Learned From PSYKSG’s Mega Series Magnus Unboxing Video. This post is going to feature a good amount of speculations, and perhaps a bit of exciting news or two. November 3, 2013 6:40 PST Edit – I’ve received a bit of clarification for the photos and blaster used in Point number 8. You can check that for an update. I also received a possible answer to where PSYK got his Magnus from, and edited that info into Point 2 of the post. EDIT #2: PSYK elaborated with me a little bit more on how he came across his Magnus blaster. That’s been edited into Point #3. Popular Nerf Youtuber Coop772 Decides To Retire From Nerf, But Why?